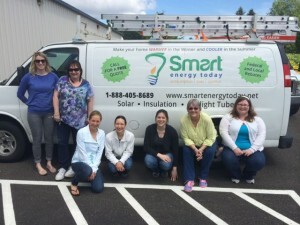 The Smart Energy Today team provides monthly dinners to educate home owners about their home's energy efficiency. What would you say if you received a letter inviting you and a guest to a free dinner at a great local restaurant serving New York steak, chicken parmigiana or grilled salmon? The catch? In order to earn the free meal you would have to sit through a lively, and informative, presentation featuring ways to cut energy costs in the home, how to take advantage of green energy tax refunds, and how to lower your carbon footprint. According to Olympia’s Smart Energy Today, Inc., hundreds of people all over the region are attending these invitation-only-dinners monthly. It is the first step in their unique business model that is quickly launching them into other markets, including Idaho, Oregon, Pennsylvania and most recently California. This is great news for Thurston County as it means more jobs and a boost to the local economy. Here is how their innovative program works. Potential customers receive an invitation in the mail to attend a dinner at a great local restaurant. The prospect must pre-register for the dinner. At the dinner, they sit through an hour-long presentation about energy efficiency in the home and products that can increase insulative properties and lower energy costs. 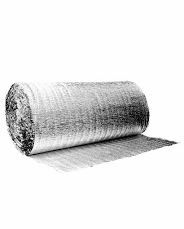 A sol blanket is a 3-in-1 product that is offered by Smart Energy Today. “The purpose of the dinner is to get people excited about the products that we offer and to gain a better understanding of how our products can reduce their energy costs,” says Julie Schade, Smart Energy’s office manager. After the meal is over, attendees can request a free home energy analysis. “The next step is going into someone’s home to complete a home energy analysis. There is no cost for the analysis. We simply evaluate the home and identify ways to lower energy costs through use of our products. We’ll write down a quote and then it is up to the homeowner to determine if they want us to do an installation,” notes Schade. Smart Energy Today, Inc.’s goal is to provide the full-spectrum of home improvement services. 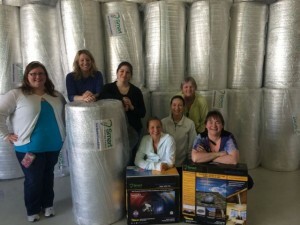 They install insulation, solar tubes, attic fans and Sol-Blankets, a 3-in-1 product that acts as a radiant barrier, insulation, and vapor barrier. But Smart Energy Today also has the products and expertise to install a new roof, new gutters and solar panels. Smart Energy can repair or upgrade just about any portion of the envelope of a home. If the envelope of a home is correctly sealed and maintained, the result is lower energy costs and a more comfortable home that is well preserved. The Smart Energy Today team provides monthly dinners to educate home owners about their home’s energy efficiency. Solar panels are the most recent addition to the product line. “Customers love our solar panels because they reduce energy costs and are a very visible symbol that someone is an innovator and part of the green movement,” said Ryan Rutledge, Smart Energy’s Social Media Manager. “Not only do we offer a variety of high-quality, guaranteed products, we are a customer-focused company. We really care about our customers. For example, in many cases, if we find we’ve overbid a project we’ll refund the customer the difference. We get a lot of customers through referrals, and we get these referrals because people appreciate our work and the end-result of lower energy costs and greater comfort,” describes Schade. Customers also enjoy the employees at Smart Energy. “This is an awesome place to work. I feel that employees are cared for and valued. We are provided with snacks in the kitchen, monthly birthday lunches, catered breakfast for installers and quarterly sales training meeting,” explains Rutledge. 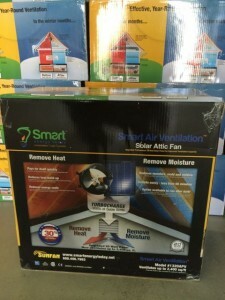 Smart Energy Today, Inc. is applying efficiency to their own business model as well as in customer’s homes. Currently, they are in the process of going paper-free in order to increase efficiency and reduce costs. “Because we are growing into other regions, our sales representatives and installers are on the road all the time. Going paperless means that all of our employees will have access to all documents, they need no matter where they are. It also means that we can quickly answer most questions because all of our data is synched in one cloud-based location,” says Schade. Add up these factors: High-quality products that are guaranteed, lower energy costs for homeowners, a more comfortable home, highly motivated and happy employees that are customer focused. The result – a company that is rocketing to success and is rapidly expanding.